Is there any better barometer of a nation’s economic health and well-being than the numbers and percentage of citizens employed and earning income sufficient to be self-supporting? Ugly numbers exposing tens of millions of Americans struggling to survive show the dark side of a shrunken economy and failed leadership supportive of nobody works, everybody gets social assistance policies. Under Barack Obama’s liberal change the nation was promised, our country has fallen to its lowest employment level percentage since the early 1980’s, continues to face pervasive unemployment that’s remained above 8 percent for the duration of his Presidency, aside from the shared 7.8 percent figure in January 2009 and a matching September estimate without California's unemployed counted, and at this point 45 months into the 44th President’s Administration has managed a U3 average above 9 percent, while the U6 rate, generally referred to as the “real unemployment” rate, has averaged 16 percent. All of the figures above come from Bureau of Labor Statistics (BLS) measures compiled from survey data collected from individuals and employers, alike. Of course, since survey data is recognized by many as open to interpretation, including statistical margins of error, some might get that BLS data is little more than a higher-end, more sophisticated version of polls being taken by dozens of organizations through this election season with a remarkable range of results. The larger sample pool for data collected by the BLS is why the figures are more reliable than the 2.5 to 3.5% margin of error common to political polls, but they are, nevertheless, survey based and statistically manipulated. How many have questioned why Seasonally Adjusted data differs substantially from what are supposed to be more accurate weekly and monthly counts? They’re simply based upon statisticians’ smoothing and limiting what appear to be anomalous peaks and valleys, according to what might be expected from prior weeks, months, and years around the same season. 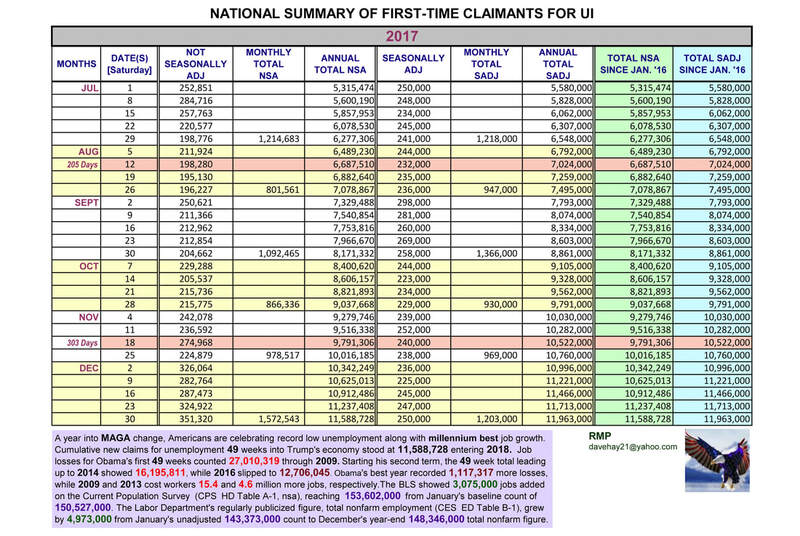 In other words, the survey data shown on BLS counts is really presenting what actuaries and high level statisticians within the Department of Labor have interpreted (and believe they can sell) what the survey responses collected monthly actually mean. Mathematicians outside of the DOL have recognized data manipulation, which shows disturbingly misleading figures, and justifiable sentiment for the acronym applied to the Statistics division having one too many letters, with little need for Labor in the middle. 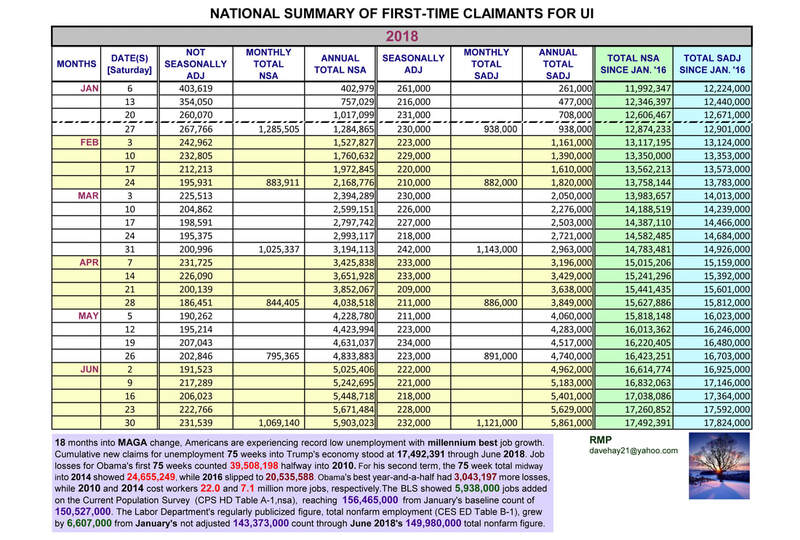 A lesser-known arm of the Department of Labor, The Employment & Training Administration (ETA), compiles counts of who’s employed and who’s filed claims after job losses directly from payroll data and unemployment claims filed with each of our 50 states nationwide. As a result, if one wants to know more about true counts and look at more accurate, fully supported data, ETA counts are far superior to anything posted for similar metrics with the BLS, which offers just statisticians’ versions of survey-based results. Select ETA data will follow here in a summary form not offered anywhere else with the DOL or on U.S. Government public information sites. The numbers are stunning to most, and what they show should be available to each and every American wishing to be heard in the upcoming election. 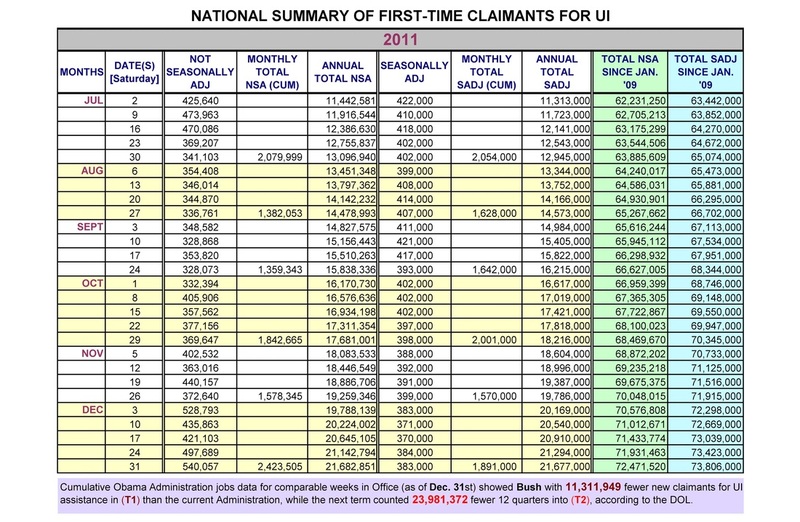 Do you have an interest, and do you think Americans have a right to know, how many workers on record as of January 21, 2009 filed unemployment claims since this Administration has been at the helm? It’s an inarguable, carefully counted number that would shock most. And Democrats have strategically engaged in fear mongering and purposely chosen the slogan, “Forward” to separate their policies from anything that might be associated with Bush Administration policies. The left’s efforts to distance from Obama’s predecessor seemed to beg for real comparative numbers that might show how Americans fared under the past two Presidents. That’s available in weekly numbers through 2009, then summarized at the end of each six months, thereafter, in the chart below. 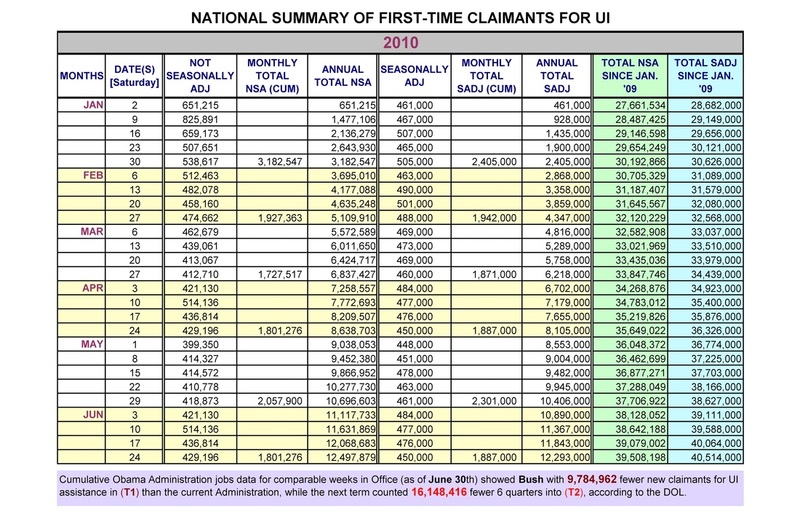 Let’s start with the total number of American workers whose jobs and income disappeared under Obama, according to ETA counts from each states’ unemployment compensation funds. As of October 27, 2012, the total number of first time claimants (new filers) reached 89,840,000 displaced former workers around the country. The well-established pattern, at this point, shows this Administration will have overseen an economy having shed 90 million jobs by election time. In a few moments, we can touch on the percentage of the economy that lost gainful employment as of the latest figures and soon-to-be 90 million count around the first week of November. Still, looking at Bush Administration numbers for comparison seems like a worthy exercise, since the left thinks Americans must not look back. The statistics show precisely why the Obama camp is terrified of anyone looking back with enough data and support for how his Administration stacks up. It gets ugly in a hurry. 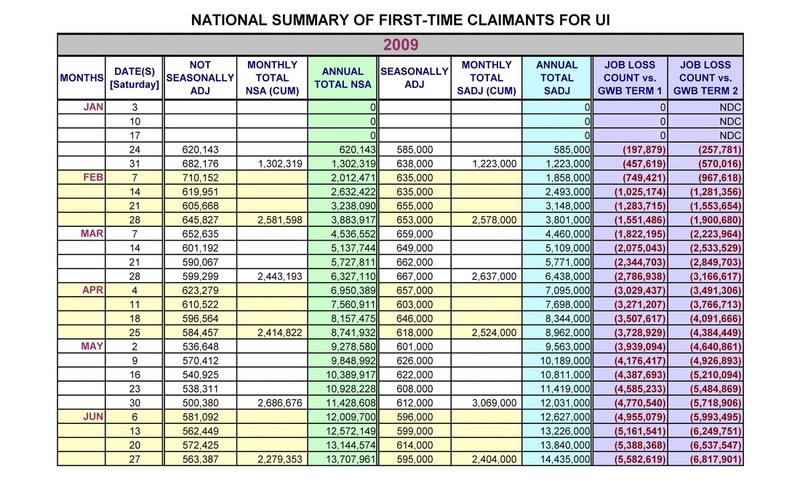 The ETA figures showed George Bush start his Presidency with 126,843,537 contributors paying into state UI accounts, and finish his term in January of 2009 with 133,886,830 payroll-documented employed Americans. 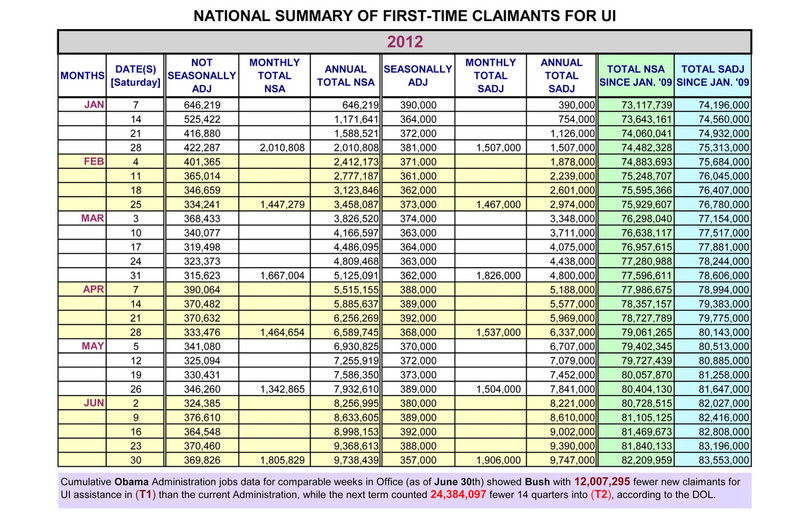 In contrast, Obama began his Presidency with the same 133 million count, but the economy shed more than 8 million workers by the third Quarter of 2010 then held steady entering the third Quarter of 2011 (still 8 million down) before inching upward to 128,066,082 in the ETA’s latest 2012 counts. That still leaves Obama 5.8 million workers short of the totals handed to him, and just a 2.5 million-worker recovery from late 2010 through September 2012, according to ETA records. If those figures surprise anyone, because they paint a different picture from the BLS figures released to the public, actual counts of workers who lost jobs during the past two Presidents latest terms is more damning yet of the current Administration. 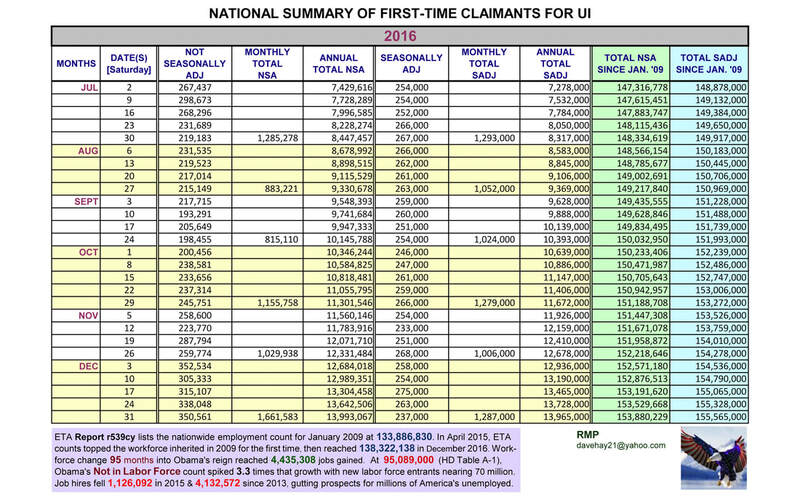 The latest summary count of all workers who filed first-time claims (new filers) for unemployment compensation reached 89,840,000 by the fourth week of October for an ugly, eye-opening cumulative count since Obama’s inauguration in January 2009. 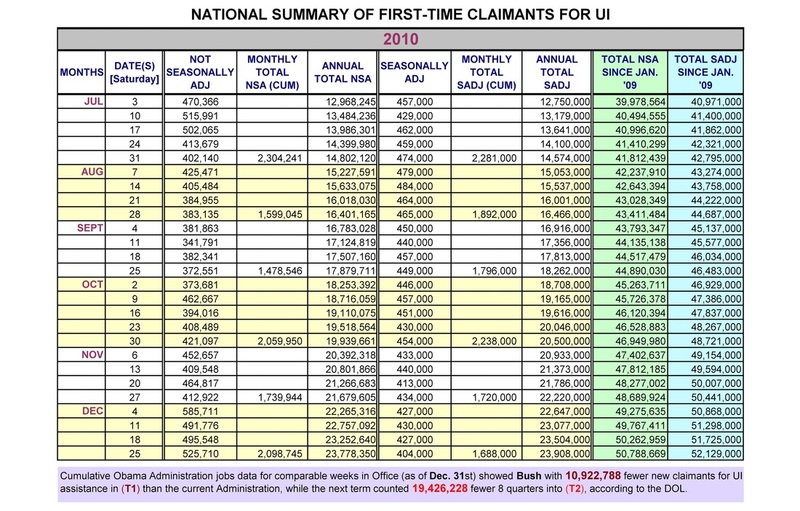 That figure shows 23.3 million more American workers who’ve filed first time claims for UI assistance than filed at the same period into George Bush’s second term. That’s right. 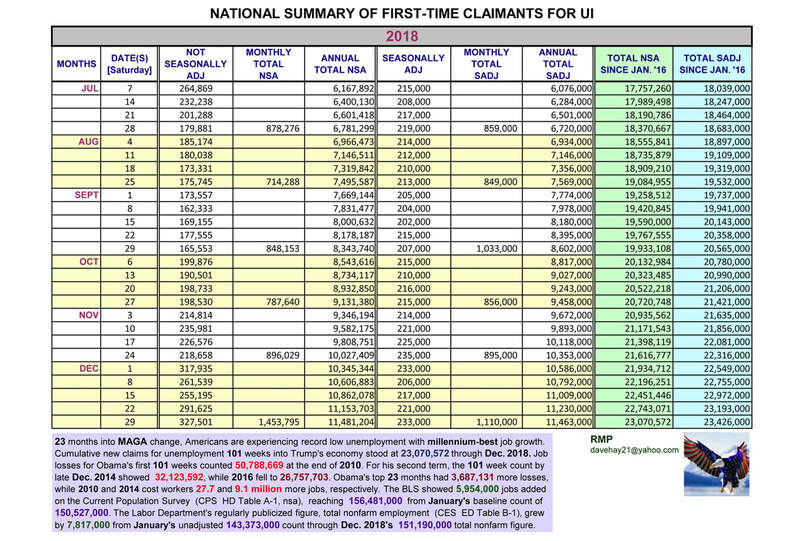 The difference between our two latest Presidents favors George Bush on the most accurate ETA, actual payroll-based data by 23.3 million fewer displaced workers filing claims after losing their jobs. Add that to a healthy, verifiable 7 million-plus workers added under Bush, in comparison to the loss of 5.8 million former gainfully employed bread winners under Obama, and the margin on that direct comparative count approaches 13 million. The ETA data was also notable for showing 19 straight fiscal Quarters of job growth under President Bush before a modest 15,557 drop at the outset of 2009. Remember, those were real payroll counts. The BLS credited Obama’s predecessor with 52 straight months of private sector growth and 51 of 54 months growth on the more encompassing, overall Employment Level counts heading into 2008, so the left’s blame game lacks basis in reality. How many reports have you seen showing Bush’s last term in Office with a remarkable 30 million-plus advantage in jobs over the workforce collapse directed by the Obama Administration? The more than 30 million difference is documented by real ETA counts and painfully real. It just needs to be made clear to the electorate to challenge voters unaware and, as yet, unconcerned about Einstein's & Robbins' reference to insanity. Is anyone still interested in a percentage of the workforce in place when Obama took Office whose jobs disappeared according to real counts of new filers, mostly referred to as first time claimants, in the ETA’s records and charts? The number of workers recognized on employer payroll records across the country was 133,886,830 during January 2009. 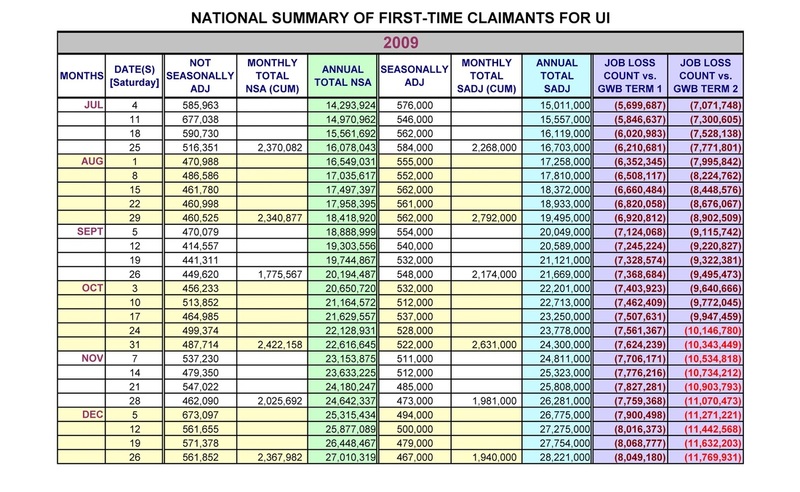 The 90 million workers counted amongst first time claimants around election time represent 67.22% of the entire workforce in place when Obama took Office, showing as many as two out of three Americans suffering life-changing job losses, strictly by the numbers. And for those Americans who love records, which have already been rewritten in ugly ways for this Administration in terms of employment futility, reelecting the Hawaiian, Indonesian, Kenyan by blood citizen of the world will move American workers “Forward” to 100 million jobs slashed from the economy by late April or early May 2013.